Anyway, I wanted to do a small bit in showing my thoughts and prayers go out to all affected by these terrorist attacks. And also to stand in solidarity with a city and country I truly love. I found these images on a site called Twisted Sifter and wanted to share them here. 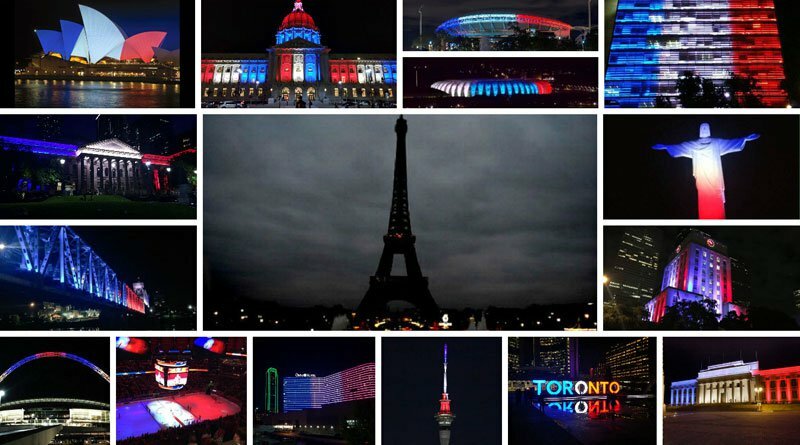 Buildings around the world showed their solidarity and support for the victims of the horrific attacks in Paris, France on November 13, 2015. From Australia to Brazil to Canada, iconic buildings and monuments projected the colours of the French flag onto their façades. At least 129 people were killed last night in coordinated attacks across Paris by eight gunmen and suicide bombers. It is the worst atrocity in Europe since the 2004 Madrid Bombings and the deadliest attacks ever in peacetime France. And here is a video of Davidd Martello playing John Lennon’s “Imagine” in front of the Bataclan Concert Hall in Paris where many people lost their lives. Mr. Martello biked up to the concert hall with piano in tow to play his tribute. Yes, such a sad day indeed. My heart and prayers go out to all the families in this unimaginable attack. It's heartbreaking. My thoughts and prayers with people in Paris. My heart goes out to those personally affected by this atrocious attack. I wish I could get my arms around all of Paris and give it a hug. I love it so much. Thanks for this tribute, Catherine. Thanks Catherine for sharing this, Yes, I was horrified too, my thoughts and prayers go out to the families in this tragic event. So sad. Thank you for the tribute, Catherine. Very sad, Catherine, well done! Such a terrible, horrible turn of events. Unexplainable, inexcusable.